The weather this week—cool and rainy—disguises the strong upwelling of energy from the depths in a fog, hiding it from our sight and leaving us with a vaguely unsettled feeling of dread. It’s worth your time to push the fog away, and center yourself in the energy of change, balancing on the crest and riding that wave. So many things this week seem to be pointing us in a dangerous, scary direction. The Dark moon is the time to step back a pace and observe, allowing your heart to slow and your breathing to relax, and looking at what is. 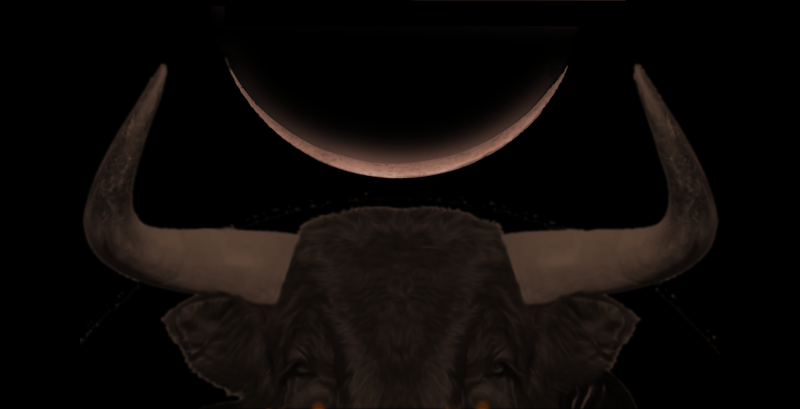 Look with the eyes of the Bull, slow and stolid, immensely powerful. As a beast of 2,000 pounds, you need fear nothing, and can make your judgements from a place of your comfort and ease.